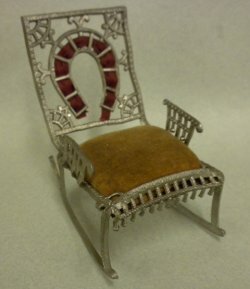 Antique soft silver metal rocker with a horseshoe design. Seat is gold/brown velveteen. These chairs are a little big for 1" scale, the back being 3-1/2" high. They would work well for mignonettes, or all bisque dolls that are 4-6" tall.